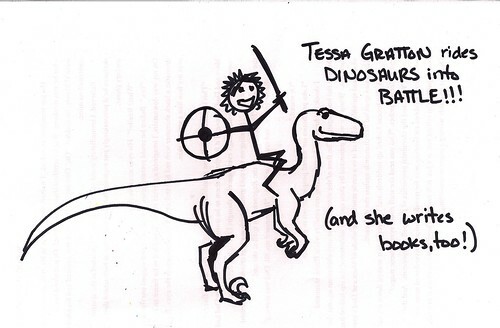 If the world was overrun by zombies, or angry pelicans, I’d pray Jessica Watson hadn’t been eaten yet and visit Tessa Gratton. I’ve no doubt that she’d be the leader of a fortified village, sheltering children, animal lovers, their pets, the elderly, and the pelicans immune to BP’s legacy. The watch towers would be manned by bow and arrow toting, finger nail painted, vibram five finger wearing, aspiring YA authors. I’d have to beat one, possibly two guards in a game of scrabble, just to get through the first gate. While being strip searched I’d be asked to come up with five synonyms for cavity. If I failed I’d be thrown into a pit with a zombie assassin, who looks suspiciously like Sarah Palin. Jessica Watson would be welcomed, because, well, she’s Jessica Watson! 1) She’s a source for inspirational quotes. "If you wrote something and saw that it was good and there was value others could receive from it, but you don't share it because you're afraid of judgement and/or misunderstanding - that is cowardice." This was the first quote I collected online, and this is the reason I write: I want to be brave, and I don’t want to fear judgement. 2) Tess is generous. She writes short stories and posts them here, and this has helped me become a better writer. 4) Tess is funny. The world can never have too much humour. 5) I’m looking forward to Tessa’s debut novel coming in 2011. Summer 2011 from Random House Children’s Books. Disclaimer thingy: Tess hasn’t mowed my lawns, fed my dogs when I’m away, line edited my WIP, or made me lemon chicken for dinner. I do have airport dreams about her, which is exciting for me, and probably creepy for her. Simon, that first quote is just what I needed to jump start my day this morning. I'm glad Tess said it, and I'm glad you shared it with us! Julie, you're welcome. Tess is great. Happy writing.